This article is about the New Delhi district, capital of India, located within the union territory of Delhi. For other uses, see New Delhi (disambiguation). New Delhi (/ˈdɛli/ ( listen)) is an urban district of Delhi which serves as the capital of India and seat of all three branches of the Government of India. The city of New Delhi is located within the National Capital Territory of Delhi. The foundation stone of the city was laid by Emperor George V during the Delhi Durbar of 1911. It was designed by British architects, Sir Edwin Lutyens and Sir Herbert Baker. The new capital was inaugurated on 13 February 1931, by Viceroy and Governor-General of India Lord Irwin. Although colloquially Delhi and New Delhi are used interchangeably to refer to the National Capital Territory of Delhi (NCT), these are two distinct entities, with New Delhi forming a small part of Delhi. The National Capital Region is a much larger entity comprising the entire NCT along with adjoining districts in neighboring states. Calcutta (now Kolkata) was the capital of India during the British Raj, until December 1911. Calcutta had become the centre of the nationalist movements since the late nineteenth century, which led to the Partition of Bengal by then Viceroy of British India, Lord Curzon. This created massive political and religious upsurge including political assassinations of British officials in Calcutta. The anti-colonial sentiments amongst the public led to complete boycott of British goods, which forced the colonial government to reunite Bengal and immediately shift the capital to New Delhi. Old Delhi had served as the political and financial centre of several empires of ancient India and the Delhi Sultanate, most notably of the Mughal Empire from 1649 to 1857. During the early 1900s, a proposal was made to the British administration to shift the capital of the British Indian Empire, as India was officially named, from Calcutta on the east coast, to Delhi. The Government of British India felt that it would be logistically easier to administer India from Delhi, which is in the centre of northern India. The land for building the new city of Delhi was acquired under the Land Acquisition Act 1894. During the Delhi Durbar on 12 December 1911, George V, then Emperor of India, along with Queen Mary, his consort, made the announcement that the capital of the Raj was to be shifted from Calcutta to Delhi, while laying the foundation stone for the Viceroy's residence in the Coronation Park, Kingsway Camp. The foundation stone of New Delhi was laid by King George V and Queen Mary at the site of Delhi Durbar of 1911 at Kingsway Camp on 15 December 1911, during their imperial visit. Large parts of New Delhi were planned by Edwin Lutyens, who first visited Delhi in 1912, and Herbert Baker, both leading 20th-century British architects. The contract was given to Sobha Singh. The original plan called for its construction in Tughlaqabad, inside the Tughlaqabad fort, but this was given up because of the Delhi-Calcutta trunk line that passed through the fort. Construction really began after World War I and was completed by 1931. The city that was later dubbed "Lutyens' Delhi" was inaugurated in ceremonies beginning on 10 February 1931 by Lord Irwin, the Viceroy. Lutyens designed the central administrative area of the city as a testament to Britain's imperial aspirations. Soon Lutyens started considering other places. Indeed, the Delhi Town Planning Committee, set up to plan the new imperial capital, with George Swinton as chairman, and John A. Brodie and Lutyens as members, submitted reports for both North and South sites. However, it was rejected by the Viceroy when the cost of acquiring the necessary properties was found to be too high. The central axis of New Delhi, which today faces east at India Gate, was previously meant to be a north-south axis linking the Viceroy's House at one end with Paharganj at the other. Eventually, owing to space constraints and the presence of a large number of heritage sites in the North side, the committee settled on the South site. A site atop the Raisina Hill, formerly Raisina Village, a Meo village, was chosen for the Rashtrapati Bhawan, then known as the Viceroy's House. The reason for this choice was that the hill lay directly opposite the Dinapanah citadel, which was also considered the site of Indraprastha, the ancient region of Delhi. Subsequently, the foundation stone was shifted from the site of Delhi Durbar of 1911–1912, where the Coronation Pillar stood, and embedded in the walls of the forecourt of the Secretariat. 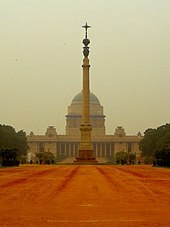 The Rajpath, also known as King's Way, stretched from the India Gate to the Rashtrapati Bhawan. The Secretariat building, the two blocks of which flank the Rashtrapati Bhawan and houses ministries of the Government of India, and the Parliament House, both designed by Baker, are located at the Sansad Marg and run parallel to the Rajpath. In the south, land up to Safdarjung's Tomb was acquired to create what is today known as Lutyens' Bungalow Zone. Before construction could begin on the rocky ridge of Raisina Hill, a circular railway line around the Council House (now Parliament House), called the Imperial Delhi Railway, was built to transport construction material and workers for the next twenty years. The last stumbling block was the Agra-Delhi railway line that cut right through the site earmarked for the hexagonal All-India War Memorial (India Gate) and Kingsway (Rajpath), which was a problem because the Old Delhi Railway Station served the entire city at that time. The line was shifted to run along the Yamuna river, and it began operating in 1924. The New Delhi Railway Station opened in 1926, with a single platform at Ajmeri Gate near Paharganj, and was completed in time for the city's inauguration in 1931. As construction of the Viceroy's House (the present Rashtrapati Bhavan), Central Secretariat, Parliament House, and All-India War Memorial (India Gate) was winding down, the building of a shopping district and a new plaza, Connaught Place, began in 1929, and was completed by 1933. Named after Prince Arthur, 1st Duke of Connaught (1850–1942), it was designed by Robert Tor Russell, chief architect to the Public Works Department (PWD). After the capital of India moved to Delhi, a temporary secretariat building was constructed in a few months in 1912 in North Delhi. Most of the government offices of the new capital moved here from the 'Old secretariat' in Old Delhi (the building now houses the Delhi Legislative Assembly), a decade before the new capital was inaugurated in 1931. Many employees were brought into the new capital from distant parts of India, including the Bengal Presidency and Madras Presidency. Subsequently, housing for them was developed around Gole Market area in the 1920s. Built in the 1940s, to house government employees, with bungalows for senior officials in the nearby Lodhi Estate area, Lodhi colony near historic Lodhi Gardens, was the last residential areas built by the British Raj. After India gained independence in 1947, a limited autonomy was conferred to New Delhi and was administered by a Chief Commissioner appointed by the Government of India. In 1966, Delhi was converted into a union territory and eventually the Chief Commissioner was replaced by a Lieutenant Governor. The Constitution (Sixty-ninth Amendment) Act, 1991 declared the Union Territory of Delhi to be formally known as National Capital Territory of Delhi. A system was introduced under which the elected Government was given wide powers, excluding law and order which remained with the Central Government. The actual enforcement of the legislation came in 1993. The first major extension of New Delhi outside of Lutyens' Delhi came in the 1950s when the Central Public Works Department (CPWD) developed a large area of land southwest of Lutyens' Delhi to create the diplomatic enclave of Chanakyapuri, where land was allotted for embassies, chanceries, high commissions and residences of ambassadors, around a wide central vista, Shanti Path. With a total area of 42.7 km2 (16.5 sq mi), New Delhi forms a small part of the Delhi metropolitan area. Since the city is located on the Indo-Gangetic Plain, there is little difference in elevation across the city. New Delhi and surrounding areas were once a part of the Aravali Range; all that is left of those mountains is the Delhi Ridge, which is also called the Lungs of Delhi. While New Delhi lies on the floodplains of the Yamuna River, it is essentially a landlocked city. East of the river is the urban area of Shahdara. New Delhi falls under the seismic zone-IV, making it vulnerable to earthquakes. New Delhi lies on several fault lines and thus experiences frequent earthquakes, most of them of mild intensity. There was a spike in the number of earthquakes between 2011 and 2015, most notable being a 5.4 magnitude earthquake in 2015 with its epicentre in Nepal, a 4.7-magnitude earthquake on 25 November 2007, a 4.2-magnitude earthquake on 7 September 2011, a 5.2-magnitude earthquake on 5 March 2012, and a swarm of twelve earthquakes, including four of magnitudes 2.5, 2.8, 3.1, and 3.3, on 12 November 2013. The climate of New Delhi is a monsoon-influenced humid subtropical climate (Köppen Cwa) bordering a hot semi-arid climate (Köppen BSh) with high variation between summer and winter in terms of both temperature and rainfall. The temperature varies from 46 °C (115 °F) in summers to around 0 °C (32 °F) in winters. The area's version of a humid subtropical climate is noticeably different from many other cities with this climate classification in that it features long and very hot summers, relatively dry and mild winters, a monsoonal period, and dust storms. Summers are long, extending from early April to October, with the monsoon season occurring in the middle of the summer. Winter starts in November and peaks in January. The annual mean temperature is around 25 °C (77 °F); monthly daily mean temperatures range from approximately 14 to 34 °C (57 to 93 °F). New Delhi's highest temperature ever recorded is 48.4 °C (119.1 °F) on 28 June 1883 while the lowest temperature ever recorded is −2.2 °C (28.0 °F) on 11 January 1967, both of which are recorded at Indira Gandhi International Airport (formerly known as Palam Airport). The average annual rainfall is 714 millimetres (28.1 in), most of which is during the monsoons in July and August. In Mercer's 2015 annual quality-of-living survey, New Delhi ranks at number 154 out of 230 cities due to bad air quality and pollution. The World Health Organization ranked New Delhi as the world's worst polluted city in 2014 among about 1,600 cities the organisation tracked around the world. In 2016, United States Environmental Protection Agency listed New Delhi as the most polluted city on Earth. Dense smog at Connaught Place, New Delhi. In an attempt to lessen air pollution in New Delhi, which gets worse during the winter, a temporary alternate-day travel scheme for cars using the odd- and even-numbered license plates system was announced by Delhi government in December 2015. In addition, trucks were to be allowed to enter India's capital only after 11 pm, two hours later than the existing restriction. The driving restriction scheme was planned to be implemented as a trial from 1 January 2016 for an initial period of 15 days. The restriction was in force between 8 am and 8 pm, and traffic was not restricted on Sundays. Public transportation service was increased during the restriction period. On 16 December 2015, the Supreme Court of India mandated several restrictions on Delhi's transportation system to curb pollution. Among the measures, the court ordered to stop registrations of diesel cars and sport utility vehicles with an engine capacity of 2,000 cc and over until 31 March 2016. The court also ordered all taxis in the Delhi region to switch to compressed natural gas by 1 March 2016. Transportation vehicles that are more than 10 years old were banned from entering the capital. Analysing real-time vehicle speed data from Uber Delhi revealed that during the odd-even program, average speeds went up by a statistically significant 5.4 per cent (2.8 standard deviation from normal). This means vehicles have lesser idling time in traffic and vehicle engines would run closer to minimum fuel consumption. "In bordering areas, PM 2.5 levels were recorded more than 400 (ug/m3) while in inner areas in Delhi, they were recorded between 150 and 210 on an average." However, the subcity of Dwarka, located in the southwest district, has a substantially low level of air pollution. At the NSIT University campus, located in sector 3 Dwarka, pollution levels were as low as 93 PPM. On 7 November 2017, the Indian Medical Association declared a public health emergency due to high pollution levels. The highest being in the Punjabi Bagh district with an Air Quality Index of 999 and in the RK Puram district with an index of 852. The lowest index recorded was in the Anand Vihar district with an index of 319. Levels of PM2.5 were recorded at 710 µg/m³, more than 11 times the World Health Organization's safe limit. In a 2018 study, New Delhi was found to be the most polluted capital out of 61 capital cities around the world. 2015 Air pollution in New Delhi (PM2.5 AQI). New Delhi has a population of 257,803. Hindi is the most widely spoken language in New Delhi and the lingua franca of the city. English is primarily used as the formal language by business and government institutes. New Delhi has a literacy rate of 89.38% according to 2011 census, which is highest in Delhi. The Sacred Heart Cathedral is a Roman Catholic cathedral and designed by British architect Henry Medd based on Italian architecture. Gurudwara Bangla Sahib a Sikh gurdwara in New Delhi. Except for Hinduism, the proportions of other religions are different and relatively lower in New Delhi as compared to entire NCT. According to 2011 census, Hinduism is the religion of 89.8% of New Delhi's population. There are also communities of Muslims (4.5%), Christians (2.9%), Sikhs (2.0%), Jains (0.4%). Other religious groups include Parsis, Buddhists and Jews. The Secretariat Building houses Ministries of Defence, Finance, Home Affairs and External Affairs. It also houses the Prime Minister's office. The national capital of India, New Delhi is jointly administered by both the Central Government of India and the local Government of Delhi, it is also the capital of the National Capital Territory (NCT) of Delhi. As of 2015[update], the government structure of the New Delhi Municipal Council includes a chairperson, three members of New Delhi's Legislative Assembly, two members nominated by the Chief Minister of the NCT of Delhi and five members nominated by the central government. The head of state of Delhi is the Lieutenant Governor of the Union Territory of Delhi, appointed by the President of India on the advice of the Central government and the post is largely ceremonial, as the Chief Minister of the Union Territory of Delhi is the head of government and is vested with most of the executive powers. According to the Indian constitution, if a law passed by Delhi's legislative assembly is repugnant to any law passed by the Parliament of India, then the law enacted by the parliament will prevail over the law enacted by the assembly. New Delhi is governed through a municipal government, known as the New Delhi Municipal Council (NDMC). Other urban areas of the metropolis of Delhi are administered by the Municipal Corporation of Delhi (MCD). However, the entire metropolis of Delhi is commonly known as New Delhi in contrast to Old Delhi. New Delhi is the largest commercial city in northern India. It has an estimated net State Domestic Product (FY 2010) of ₹1,595 billion (US$22 billion) in nominal terms and ~₹6,800 billion (US$95 billion) in PPP terms. As of 2013[update], the per capita income of Delhi was Rs. 230000, second highest in India after Goa. GSDP in Delhi at the current prices for 2012–13 is estimated at Rs 3.88 trillion (short scale) against Rs 3.11 trillion (short scale) in 2011–12. Connaught Place, one of North India's largest commercial and financial centres, is located in the northern part of New Delhi. Adjoining areas such as Barakhamba Road, ITO are also major commercial centres. Government and quasi government sector was the primary employer in New Delhi. The city's service sector has expanded due in part to the large skilled English-speaking workforce that has attracted many multinational companies. Key service industries include information technology, telecommunications, hotels, banking, media and tourism. The 2011 World Wealth Report ranks economic activity in New Delhi at 39, but overall the capital is ranked at 37, above cities like Jakarta and Johannesburg. New Delhi with Beijing shares the top position as the most targeted emerging markets retail destination among Asia-Pacific markets. The Government of National Capital Territory of Delhi does not release any economic figures specifically for New Delhi but publishes an official economic report on the whole of Delhi annually. According to the Economic Survey of Delhi, the metropolis has a net State Domestic Product (SDP) of Rs. 830.85 billion (for the year 2004–05) and a per capita income of Rs. 53,976($1,200). In the year 2008–09 New Delhi had a Per Capita Income of Rs. 116,886 ($2,595).It grew by 16.2% to reach Rs. 135,814 ($3,018) in 2009–10 fiscal. New Delhi's Per Capita GDP (at PPP) was at $6,860 during 2009–10 fiscal, making it one of the richest cities in India. The tertiary sector contributes 78.4% of Delhi's gross SDP followed by secondary and primary sectors with 20.2% and 1.4% contribution respectively. The gross state domestic product (GSDP) of Delhi at current prices for the year 2011–12 has been estimated at Rs 3.13 trillion (short scale), which is an increase of 18.7 per cent over the previous fiscal. New Delhi is a cosmopolitan city due to the multi-ethnic and multi-cultural presence of the vast Indian bureaucracy and political system. The city's capital status has amplified the importance of national events and holidays. National events such as Republic Day, Independence Day and Gandhi Jayanti (Gandhi's birthday) are celebrated with great enthusiasm in New Delhi and the rest of India. On India's Independence Day (15 August) the Prime Minister of India addresses the nation from the Red Fort. Most Delhiites celebrate the day by flying kites, which are considered a symbol of freedom. The Republic Day Parade is a large cultural and military parade showcasing India's cultural diversity and military might. Religious festivals include Diwali (the festival of light), Maha Shivaratri, Teej, Durga Puja, Mahavir Jayanti, Guru Nanak Jayanti, Holi, Lohri, Eid ul-Fitr, Eid ul-Adha, Raksha Bandhan, and Christmas. The Qutub Festival is a cultural event during which performances of musicians and dancers from all over India are showcased at night, with the Qutub Minar as the chosen backdrop of the event. Other events such as Kite Flying Festival, International Mango Festival and Vasant Panchami (the Spring Festival) are held every year in Delhi. In 2007, the Japanese Buddhist organisation Nipponzan Myohoji decided to build a Peace Pagoda in the city containing Buddha relics. It was inaugurated by the current Dalai Lama. The National Museum in New Delhi is one of the largest museums in India. New Delhi is home to several historic sites and museums. The National Museum which began with an exhibition of Indian art and artefacts at the Royal Academy in London in the winter of 1947–48 was later at the end was shown at the Rashtrapati Bhawan in 1949. Later it was to form a permanent National Museum. On 15 August 1949, the National Museum was formally inaugurated and currently has 200,000 works of art, both of Indian and foreign origin, covering over 5,000 years. The India Gate built in 1931 was inspired by the Arc de Triomphe in Paris. It is the national monument of India commemorating the 90,000 soldiers of the Indian Army who lost their lives while fighting for the British Raj in World War I and the Third Anglo-Afghan War. The monument is barricaded now with entry to inside arch restricted. The Rajpath which was built similar to the Champs-Élysées in Paris is the ceremonial boulevard for the Republic of India located in New Delhi. The annual Republic Day parade takes place here on 26 January. The Beating retreat takes place here 2 days later. The Rajghat, the final resting place of Mahatma Gandhi. Gandhi Smriti in New Delhi is the location where Mahatma Gandhi spent the last 144 days of his life and was assassinated on 30 January 1948. Rajghat is the place where Mahatma Gandhi was cremated on 31 January 1948 after his assassination and his ashes were buried and make it a final resting place beside the sanctity of the Yamuna River. The Raj Ghat in the shape of large square platform with black marble was designed by architect Vanu Bhuta. Jantar Mantar located in Connaught Place was built by Maharaja Jai Singh II of Jaipur. It consists of 13 architectural astronomy instruments. The primary purpose of the observatory was to compile astronomical tables, and to predict the times and movements of the sun, moon and planets. New Delhi is home to Indira Gandhi Memorial Museum, National Gallery of Modern Art, National Museum of Natural History, National Rail Museum, National Handicrafts and Handlooms Museum, National Philatelic Museum, Nehru Planetarium, Shankar's International Dolls Museum. and Supreme Court of India Museum. In the coming years, a new National War Memorial and Museum will be constructed in New Delhi for ₹4,000 million (US$56 million). New Delhi is particularly renowned for its beautifully landscaped gardens that can look quite stunning in spring. The largest of these include Buddha Jayanti Park and the historic Lodi Gardens. In addition, there are the gardens in the Presidential Estate, the gardens along the Rajpath and India Gate, the gardens along Shanti Path, the Rose Garden, Nehru Park and the Railway Garden in Chanakya Puri. Also of note is the garden adjacent to the Jangpura Metro Station near the Defence Colony Flyover, as are the roundabout and neighbourhood gardens throughout the city. The New Delhi Municipal Council (NDMC) area was declared the cleanest in North India, based on solid waste management, access to sanitation and other parameters of cleanliness, under the zone-wise Swachh Survekshan 2017. Indira Gandhi International Airport, situated to the southwest of Delhi, is the main gateway for the city's domestic and international civilian air traffic. In 2012–13, the airport was used by more than 35 million passengers, making it one of the busiest airports in South Asia. Terminal 3, which cost ₹96.8 billion (US$1.3 billion) to construct between 2007 and 2010, handles an additional 37 million passengers annually. The Delhi Flying Club, established in 1928 with two de Havilland Moth aircraft named Delhi and Roshanara, was based at Safdarjung Airport which started operations in 1929, when it was the Delhi's only airport and the second in India. The airport functioned until 2001, however in January 2002 the government closed the airport for flying activities because of security concerns following the New York attacks in September 2001. Since then, the club only carries out aircraft maintenance courses, and is used for helicopter rides to Indira Gandhi International Airport for VIP including the president and the prime minister. In 2010, Indira Gandhi International Airport (IGIA) was conferred the fourth best airport award in the world in the 15–25 million category, and Best Improved Airport in the Asia-Pacific Region by Airports Council International. The airport was rated as the Best airport in the world in the 25–40 million passengers category in 2015, by Airports Council International. Delhi Airport also bags two awards for The Best Airport in Central Asia/India and Best Airport Staff in Central Asia/India at the Skytrax World Airport Awards 2015. New Delhi has one of India's largest bus transport systems. Buses are operated by the state-owned Delhi Transport Corporation (DTC), which owns largest fleet of compressed natural gas (CNG)-fueled buses in the world. Personal vehicles especially cars also form a major chunk of vehicles plying on New Delhi roads. New Delhi has the highest number of registered cars compared to any other metropolitan city in India. Taxis and Auto Rickshaws also ply on New Delhi roads in large numbers. New Delhi has one of the highest road density in India and average vehicle speed is around 15-20 kmph in peak hours in the city. Inner Ring Road is one of the most important "state highways" in New Delhi. It is a 51 km long circular road, which connects important areas in New Delhi. Owing to more than 2 dozen grade-separators/flyovers, the road is almost signal-free. Outer Ring Road is another major artery in New Delhi that links far-flung areas of Delhi. The Delhi Noida Direct Flyway (DND Flyway) is an eight-laned access controlled tolled expressway which connects New Delhi and Delhi to Noida (an important satellite city of Uttar Pradesh). The acronym DND stands for "Delhi-Noida Direct". 'The Delhi Gurgaon Expressway is a 28 km (17 mi) expressway connecting New Delhi to Gurgaon, an important satellite city of Haryana. The Delhi Faridabad Skyway is controlled tolled expressway which connects New Delhi to Faridabad, an important satellite city of Haryana. National Highway 19 (India) (old number: NH 2), commonly referred as Delhi-Kolkata Road is a busy Indian National Highway that runs through the states of Delhi, Haryana, Uttar Pradesh, Bihar, Jharkhand, and West Bengal. National Highway 44 (India) is a National Highway that connects Srinagar with Kanyakumari and passes through Delhi. National Highway 48 (India) is a National Highway that connects New Delhi with Chennai. National Highway 9 (India) is a National Highway that connects Malout in Punjab to Pithoragarh in Uttarakhand and passes through Delhi. New Delhi is a major junction in the Indian railway network and is the headquarters of the Northern Railway. The five main railway stations are New Delhi railway station, Old Delhi, Nizamuddin Railway Station, Anand Vihar Railway Terminal and Sarai Rohilla. The Delhi Metro, a mass rapid transit system built and operated by Delhi Metro Rail Corporation (DMRC), serves many parts of Delhi and the neighbouring cities Faridabad, Gurgaon, Noida and Ghaziabad. As of December 2016, the metro consists of six operational lines with a total length of 213 km (132 mi) and 160 stations. Several other lines are under construction and expected to be commissioned in 2017 adding another 150 km length. It carries almost 3 million passengers every day. In addition to the Delhi Metro, a suburban railway, the Delhi Suburban Railway exists. The Delhi Metro is a rapid transit system serving New Delhi, Delhi, Gurgaon, Faridabad, Noida, and Ghaziabad in the National Capital Region of India. Delhi Metro is the world's 12th largest metro system in terms of length. Delhi Metro was India's first modern public transportation system, which had revolutionised travel by providing a fast, reliable, safe, and comfortable means of transport. Presently, the Delhi Metro network consists of 296 kilometres (184 miles) of track, with 160 stations along with six more stations of the Airport Express Link. The network has now crossed the boundaries of Delhi to reach NOIDA and Ghaziabad in Uttar Pradesh, Gurgaon and Faridabad in Haryana. All stations have escalators, elevators, and tactile tiles to guide the visually impaired from station entrances to trains. It has a combination of elevated, at-grade, and underground lines, and uses both broad gauge and standard gauge rolling stock. Four types of rolling stock are used: Mitsubishi-ROTEM Broad gauge, Bombardier MOVIA, Mitsubishi-ROTEM Standard gauge, and CAF Beasain Standard gauge. According to a study, Delhi Metro has helped in removing about 390,000 vehicles from the streets of Delhi. Delhi Metro is being built and operated by the Delhi Metro Rail Corporation Limited (DMRC), a state-owned company with equal equity participation from Government of India and Government of National Capital Territory of Delhi. However, the organisation is under administrative control of Ministry of Urban Development, Government of India. Besides construction and operation of Delhi metro, DMRC is also involved in the planning and implementation of metro rail, monorail and high-speed rail projects in India and providing consultancy services to other metro projects in the country as well as abroad. The Delhi Metro project was spearheaded by Padma Vibhushan E. Sreedharan, the managing director of DMRC and popularly known as the "Metro Man" of India. He famously resigned from DMRC, taking moral responsibility for a metro bridge collapse which took five lives. Sreedharan was awarded with the prestigious Legion of Honour by the French Government for his contribution to Delhi Metro. Rashtrapati Bhavan is the official residence of the President of India and is the largest residence of any head of state in the world. Much of New Delhi, planned by the leading 20th-century British architect Edwin Lutyens, was laid out to be the central administrative area of the city as a testament to Britain's imperial ambitions. New Delhi is structured around two central promenades called the Rajpath and the Janpath. The Rajpath, or King's Way, stretches from the Rashtrapati Bhavan to the India Gate. The Janpath (Hindi: "Path of the People"), formerly Queen's Way, begins at Connaught Circus and cuts the Rajpath at right angles. 19 foreign embassies are located on the nearby Shantipath (Hindi: "Path of Peace"), making it the largest diplomatic enclave in India. At the heart of the city is the magnificent Rashtrapati Bhavan (formerly known as Viceroy's House) which sits atop Raisina Hill. The Secretariat, which houses ministries of the Government of India, flanks out of the Rashtrapati Bhavan. The Parliament House, designed by Herbert Baker, is located at the Sansad Marg, which runs parallel to the Rajpath. Connaught Place is a large, circular commercial area in New Delhi, modelled after the Royal Crescent in England. Twelve separate roads lead out of the outer ring of Connaught Place, one of them being the Janpath. The New Delhi town plan, like its architecture, was chosen with one single chief consideration: to be a symbol of British power and supremacy. All other decisions were subordinate to this, and it was this framework that dictated the choice and application of symbology and influences from both Hindu and Islamic architecture. It took about 20 years to build the city from 1911. Many elements of New Delhi architecture borrow from indigenous sources; however, they fit into a British Classical/Palladian tradition. The fact that there were any indigenous features in the design were due to the persistence and urging of both the Viceroy Lord Hardinge and historians like E.B. Havell. The 2010 Commonwealth Games opening ceremony in Jawaharlal Nehru Stadium. In the foreground is the aerostat. The city hosted the 2010 Commonwealth Games and annually hosts Delhi Half Marathon foot-race. The city has previously hosted the 1951 Asian Games and the 1982 Asian Games. New Delhi was interested in bidding for the 2019 Asian Games but was turned down by the government on 2 August 2010 amid allegations of corruption in 2010 Commonwealth Games. Major sporting venues in New Delhi include the Jawaharlal Nehru Stadium, Ambedkar Stadium, Indira Gandhi Indoor Stadium, Feroz Shah Kotla Ground, R.K. Khanna Tennis Complex, Dhyan Chand National Stadium and Siri Fort Sports Complex. Aerial View of New Delhi. Clicking on a building in the picture causes the browser to load the existing article about that building. 2012 BRICS Summit in New Delhi. First plenary session of the Asian Regional Conference of the I.L.O. in New Delhi on 27 October 1947. 4th BRICS Summit in New Delhi in 2012 and First plenary session of the Asian Regional Conference of International Labour Organization in New Delhi on October 1947. The city is home to numerous international organisations. The Asian and Pacific Centre for Transfer of Technology of the UNESCAP servicing the Asia-Pacific region is headquartered in New Delhi. 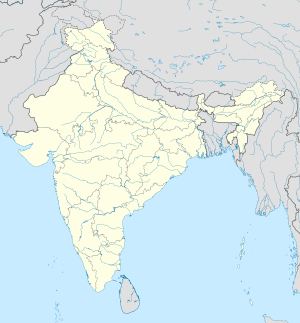 New Delhi is home to most UN regional offices in India namely the UNDP, UNODC, UNESCO, UNICEF, WFP, UNV, UNCTAD, FAO, UNFPA, WHO, World Bank, ILO, IMF, UNIFEM, IFC and UNAIDS. UNHCR Representation in India is also located in the city. New Delhi hosts 145 foreign embassies and high commissions. United Nations Conference on Trade and Development hosted its second meeting conference in the year 1968 at New Delhi. New Delhi hosted the 7th NAM Summit in 1983, 4th BRICS Summit in 2012 and the IBSA Summit in 2015. It will also host 5th Global Conference on CyberSpace in November 2017. India will also host the G20 summit in 2022 in New Delhi. ^ Amanda Briney. "Geography of New Delhi". About.com Education. 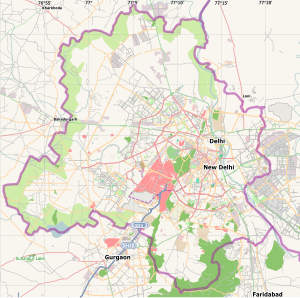 ^ a b "Delhi (India): Districts, Cities and Towns - Population Statistics, Charts and Map". City Population. Retrieved 21 March 2017. ^ "The World's Cities in 2016" (PDF). United Nations. October 2016. p. 4. Retrieved 4 March 2017. ^ Lahiri, Tripti (13 January 2012). "New Delhi: One of History's Best-Kept Secrets". The Wall Street Journal. ^ Stancati, Margherita (8 December 2011). "New Delhi becomes the capital of Independent India". The Wall Street Journal. Retrieved 11 December 2011. ^ "86 years ago New Delhi took over as power capital of India". Times Of India. ^ a b Wright, Tom (11 November 2011). "Why Delhi? The Move From Calcutta". The Wall Street Journal. Retrieved 16 November 2011. ^ Wright, Tom (22 November 2011). "In 1911, Rush to Name Delhi as Capital Causes a Crush". The Wall Street Journal. Retrieved 3 December 2011. ^ "Was New Delhi a Death Knell for Calcutta?". The Wall Street Journal. 28 November 2011. Retrieved 3 December 2011. ^ Hall, P (2002). Cities of Tomorrow. Blackwell Publishing. pp. 198–206. ISBN 978-0-631-23252-0. ^ Coronation park[dead link] Hindustan Times, 14 August 2008. ^ Lahiri, Tripti (20 November 2011). "The New Delhis That Might Have Been". The Wall Street Journal. Retrieved 3 December 2011. ^ Patwant, Singh (2002–2003). "Sir Edwin and the building" (PDF). wmf.org. Archived from the original (PDF) on 16 May 2011. Retrieved 31 December 2013. ^ "New Delhi: The Inaugural Ceremony". The Times (45744). London. 11 February 1931. p. 12. ^ "Yadgaar" (PDF). National Museum, New Delhi. Archived from the original (PDF) on 29 December 2009. Retrieved 18 May 2010. ^ a b "Architecture of New Delhi". Apollo. Retrieved 30 January 2012. ^ "A fine balance of luxury and care". Hindustan Times. 21 July 2011. Archived from the original on 14 December 2014. ^ "When Railways nearly derailed New Delhi". Hindustan Times. 18 January 2011. Archived from the original on 26 September 2013. ^ "CP's blueprint: Bath's Crescent". Hindustan Times. 8 February 2011. Archived from the original on 3 January 2013. ^ "Capital story: Managing a New Delhi". Hindustan Times. 1 September 2011. Archived from the original on 8 December 2012. ^ "A tale of two cities". Hindustan Times. 1 September 2011. Archived from the original on 2 July 2015. ^ "The Constitution (Sixty-Ninth Amendment) Act, 1991". The Constitution (Amendment) Acts, The Constitution of India. National Informatics Centre, Ministry of Communications and Information Technology, Government of India. Retrieved 8 January 2007. ^ Viswambhar Nath (2007). "Delhi Before 1947". Urbanization, urban development, and metropolitan cities in India. Concept Publishing Company. pp. 248, 251. ISBN 978-81-8069-412-7. ^ "NDMC Act". Ndmc.gov.in. Archived from the original on 2 March 2008. Retrieved 4 November 2008. ^ "Hazard profiles of Indian districts" (PDF). National Capacity Building Project in Disaster Management. UNDP. Archived from the original (PDF) on 19 May 2006. Retrieved 23 August 2006. ^ a b "Ever recorded Maximum and minimum temperatures up to 2010" (PDF). India Meteorological Department. Archived from the original (PDF) on 21 May 2013. Retrieved 16 May 2014. ^ "Chapter 1: Introduction" (PDF). Economic Survey of Delhi, 2005–2006. Planning Department, Government of National Capital Territory of Delhi. pp. 1–7. Archived from the original (PDF) on 13 November 2016. Retrieved 21 December 2006. ^ "New Delhi (Safdarjung) Climatological Table Period: 1981–2010". India Meteorological Department. Retrieved 6 April 2016. ^ "New Delhi Climate Normals 1971–1990". National Oceanic and Atmospheric Administration. Retrieved 21 December 2012. ^ "2015 Quality of Living Survey". Mercer. 8 March 2015. ^ "Bad Air Chokes New Delhi's Livability Ranking". The Wall Street Journal. 8 March 2015. ^ "New Delhi, the World's Most Polluted City, Is Even More Polluted Than We Realized". Time. 8 March 2015. ^ "Rickshaw research reveals extreme Delhi pollution". Associated Press. 26 November 2014. Archived from the original on 2 February 2015. ^ "India's air pollution is so bad it's reducing life expectancy by 3.2 years". Vox. 8 March 2015. ^ a b c Nida Najar (4 December 2015). "Delhi to Limit Use of Cars in an Effort to Control Pollution". The New York Times. Retrieved 5 December 2015. ^ "New Delhi is the most polluted city on Earth right now". CNN. 8 November 2016. ^ "New Delhi is the most polluted city on Earth: US Environmental Protection Agency". The Financial Express (India). 8 November 2016. ^ "Have taken note of odd-even formula of plying of vehicles: Delhi Police". Daily News and Analysis. Press Trust of India. 8 December 2015. Retrieved 9 December 2015. ^ Nida Najar (16 December 2015). "India, choking on pollution, Restricts Vehicle Use in Delhi". The New York Times. Retrieved 19 December 2015. ^ "Yes, Delhi, it worked". 19 January 2016. ^ "Odd-even scheme likely to return in Delhi after March; schools, 2nd car among concerns - Times of India". ^ a b Safi, Michael (7 November 2017). "Delhi doctors declare pollution emergency as smog chokes city". the Guardian. ^ "Delhi air pollution: Public health emergency declared; people advised not to venture outside". 7 November 2017. ^ "New Delhi is world`s most polluted capital". Dawn. Retrieved 6 March 2019. ^ "Know about Delhi Fast Facts, Area, population, Geographical Location, Languages". ^ "Provisional Population Totals, Census of India 2011; Cities having population 1 lakh and above" (PDF). Office of the Registrar General & Census Commissioner, India. Retrieved 26 March 2012. ^ a b c "Religion PCA". censusindia.gov.in. Government of India. Archived from the original on 7 July 2016. Retrieved 8 July 2016. In the downloaded Excel file, scroll down to row number 56 which mentions religious data for NDMC. ^ "Data on Religion". Census of India 2001. p. 1. Archived from the original on 14 May 2007. Retrieved 16 May 2006. ^ "NDMC City Census 2011 data". Census2011 India. Retrieved 24 March 2017. ^ "The Constitution (Amendment)". Indiacode.nic.in. Retrieved 4 November 2008. ^ "Government of NCT of Delhi". Indian Government. Archived from the original on 10 May 2012. Retrieved 14 June 2012. ^ "New Delhi: Overall rank 37; Economic activity rank 39 by 2011 Wealth Report". Rediff Business. 21 April 2011. Retrieved 29 June 2011. ^ "New Delhi is now among global retail hotspots". Hindustan Times. 9 May 2013. Archived from the original on 11 May 2013. Retrieved 12 May 2013. ^ a b c "Chapter 2: State Income" (PDF). Economic Survey of Delhi, 2005–2006. Planning Department, Government of National Capital Territory of Delhi. pp. 8–16. Archived from the original (PDF) on 14 June 2007. Retrieved 21 December 2006. ^ "Delhi's GDP at Rs 3 lakh cr for 2011–12". ^ "Independence Day". 123independenceday.com. Retrieved 4 January 2007. ^ Ray Choudhury, Ray Choudhury (28 January 2002). "R-Day parade, an anachronism?". Business Line. Retrieved 13 January 2007. ^ a b "Fairs & Festivals of Delhi". Delhi Travel. India Tourism.org. Retrieved 13 January 2007. ^ Tankha, Madhur (15 December 2005). "It's Sufi and rock at Qutub Fest". The Hindu. Chennai, India. Retrieved 13 January 2007. ^ "History of the National Museum". Archived from the original on 28 March 2010. Retrieved 25 January 2011. ^ "Delhi- 100 years as the Capital". The Hindu. Chennai, India. 1 February 2011. ^ a b c d "New Delhi: A New Capital". Boloji.com. 30 January 2012. Archived from the original on 7 November 2017. Retrieved 29 January 2012. ^ "Complete list of Museums in city of New Delhi and Union Territory of Delhi". Government of Delhi, India. 12 January 2012. Archived from the original on 9 April 2012. ^ "Supreme Court of India – Museum" (PDF). Supreme Court of India. 19 October 2012. Archived from the original (PDF) on 4 March 2016. ^ "National War Memorial and National War Memorial Museum to come up at India Gate at New Delhi, India". The Indian Express. 19 October 2012. ^ "Finally, plans for National War Memorial approved: Defence Minister of India". NDTV. 19 October 2012. ^ "National War Memorial finalized at India Gate complex". The Times of India. 24 August 2014. ^ "National War Memorial: What It Could Look Like". NDTV. 12 July 2014. ^ "New Delhi cleanest in north: Swachh survey". ^ "Delhi Indira Gandhi International Airport (IGI)". Airport-delhi.com. 2 May 1986. Retrieved 7 September 2009. ^ "Delhi's CNG success inspiring many countries: Naik". outlookindia.com. Press Trust of India. 11 December 2002. Archived from the original on 1 February 2009. Retrieved 2 November 2008. ^ "New Delhi – Indira Gandhi International Airport (DEL) information". Essential Travel Ltd., UK. Archived from the original on 19 July 2006. Retrieved 29 April 2006. ^ "India begins $1.94b Delhi airport revamp". Daily Times. Pakistan. 18 February 2007. Archived from the original on 16 January 2009. Retrieved 3 November 2008. ^ a b "Mecca for young aviators". Hindustan Times. 23 September 2011. Archived from the original on 15 July 2015. ^ "Ministries in row over Safdarjung Airport land". The Times of India. 13 April 2011. ^ "ASQ Testimonials". www.aci.aero. Retrieved 19 January 2017. ^ "Delhi's Indira Gandhi International Airport bags two international awards in Paris". The Economic Times. 17 March 2015. Retrieved 17 March 2015. ^ "Capital chaos: Delhi's traffic has slowed down and doubled time spent on roads". 15 December 2016. ^ "Chapter 12: Transport" (PDF). Economic Survey of Delhi, 2005–2006. Planning Department, Government of National Capital Territory of Delhi. pp. 130–146. Archived from the original (PDF) on 16 January 2007. Retrieved 21 December 2006. ^ "Delhi metro to JLN Stadium rolls out, Phase-II almost complete". Daily News and Analysis (DNA). 3 October 2010. Retrieved 3 October 2010. ^ "10 years of Delhi Metro". delhimetrorail.com. 24 January 2013. ^ "Changing Delhi map makes Ring Railway redundant". The Indian Express. 22 February 2011. ^ "Embassies in Delhi, Embassies Address, Contacts, E-Mail, Delhi Embassies". Delhionline.in. Retrieved 4 November 2008. ^ a b The Millennium Book on New Delhi. Oxford University Press, USA. 2001. ISBN 978-0-19-565445-5. ^ "New Delhi's controversial birth". NDTV. Retrieved 10 March 2012. ^ "The Building of New Delhi". The Wall Street Journal. 30 January 2012. ^ "Indian government says no to bid for 2019 Asian Games". NDTV India. 2 August 2010. Archived from the original on 5 August 2010. Retrieved 2 August 2010. ^ "The Asian and Pacific Centre for Transfer of Technology of the UNESCAP". Asian and Pacific Centre for Transfer of Technology, UNESCAP. Archived from the original on 13 August 2013. ^ "Plans for the BRICS Delhi Summit: March 29, 2012" (PDF). brics.utoronto.ca. Retrieved 16 January 2012. ^ India, Press Trust of (2014-07-17). "India to host IBSA Summit 2015 in New Delhi". Business Standard. Retrieved 18 July 2014. ^ Singh, Mahim Pratap (2014-07-17). "India to host IBSA Summit next year". The Hindu. Retrieved 18 July 2014. ^ "India to Host Global Conference on Cyber Space 2017 – World's Largest Conference on Cyber Space". Press Information Bureau. Retrieved 25 July 2017. ^ Agarwal, Surabhi (2017-07-21). "PM Narendra Modi to inaugurate Global Conference on Cyber Space". The Economic Times. Retrieved 25 July 2017. ^ Chaudhury, Dipanjan Roy (2018-12-02). "India to host G20 summit in 2022". The Economic Times. ^ "Moscow and New Delhi twin cities strengthen friendly ties". 7 September 2012. Retrieved 3 August 2016. ^ Rajan, DS (27 October 2013). "India & China: An Assessment of October 2013 Agreements". Institute of Peace and Conflict Studies. Retrieved 4 February 2015. Byron, Robert. (1997). Architectural Review, New Delhi. London: Asian Educational Services; 2 edition. pp. 36 pages. ISBN 978-8120612860. Kapoor, Pramod; Malvika Singh; Rudrangshu Mukherjee (2009). New Delhi: Making of a Capital. Lustre Press. ISBN 978-81-7436-574-3. Byron, Robert (1931). New Delhi. The Architectural Review, Westminster. Volwahsen, Andreas. (2003). Imperial Delhi: The British Capital of the Indian Empire. Prestel Publishing. pp. 320 pages. ISBN 978-3791327884. Kumar, Pushpam (February 2009). "Assessment of Economic Drivers of Land Use Change in Urban Ecosystems of Delhi, India". AMBIO. 38 (1): 35–39. doi:10.1579/0044-7447-38.1.35. Ridley, Jane. "Edwin Lutyens, New Delhi, and the Architecture of Imperialism," Journal of Imperial & Commonwealth History, May 1998, Vol. 26 Issue 2, pp 67–83. Bardiar, Nilendra. (2014). Urban, Cultural, Economic and Social Transformation: History of New Delhi 1947–65. New Delhi: Ruby Press & Co. ISBN 978-93-82395-49-2. Sonne, Wolfgang. Representing the State: Capital City Planning in the Early Twentieth Century (2003) 367pp; compares New Delhi, Canberra, Washington & Berlin. Pothen, Nayantara. (2012). Glittering Decades New Delhi in Love and War. Penguin. pp. 288 pages. ISBN 978-0670086009.